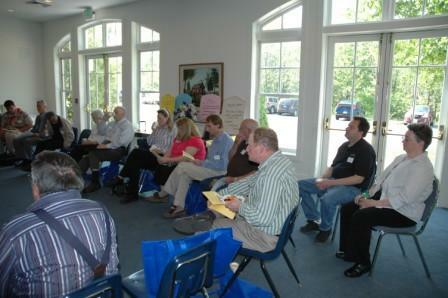 On Saturday, May 5, 2012, members, guests, and speakers met in Columbia for the Coalition’s 21st Annual Meeting. The venue was the Christ Episcopal Church building. 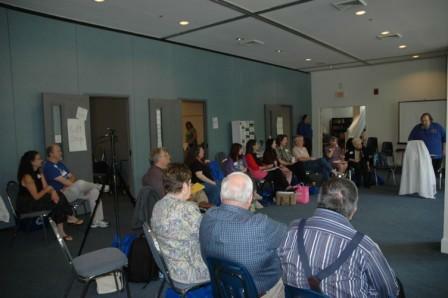 The day was beautiful and approximately 36 people attended the meeting. The members arrived, registered, and collected their tote bags that included rice paper, lumber crayons and directions on how to do a gravestone rubbing. Amanda Becker was responsible for planning the gift bags. The members enjoyed refreshments of pastries, muffins, fruit, and juices. 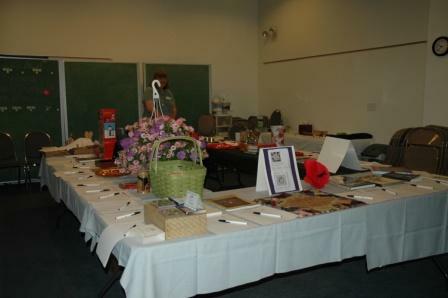 The silent auction table opened early in the morning with many items, donated by the members, available for bidding. 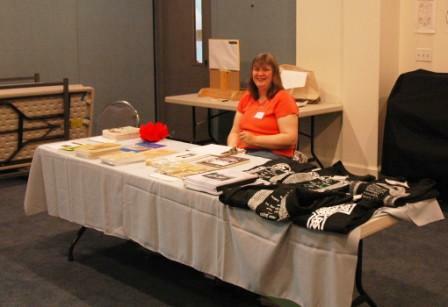 Frances Becker graciously manned the gift shop again this year while Amanda Becker stayed near the silent auction table to help with last minute donations and answer questions. At 9:30 a.m. President Melvin Mason opened the meeting. He welcomed all who made the trip to Columbia and gave his report. Click here to read his messge. 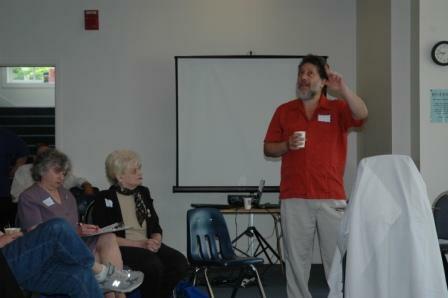 David Zinner, Maryland cemetery advocate and director of an organization that provides educational resources on Jewish burial, mourning customs, and cemeteries, spoke about strategies members can use to put their organizations on the frontline. Some of the suggestions he made included the makeup of the cemetery boards. The boards should include someone from the immediate community, family members, landscapers/gardeners, someone from the business community, a genealogist, a conservator, a politician, and representatives from the Boy Scouts and Girl Scouts. He even put the Coalition on the line by making suggestions that included changes to our website and an online message board for people to post questions. At the end of David’s presentation the business meeting was held. 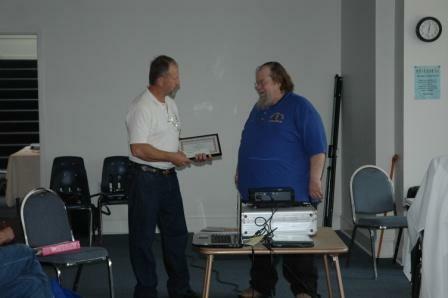 The Coalition presented three Periwinkle Awards this year. 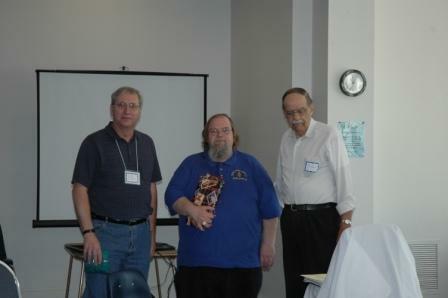 The recipients were Justin Stein, the Friends of St. Vincent’s Cemetery, and Donald Willey. 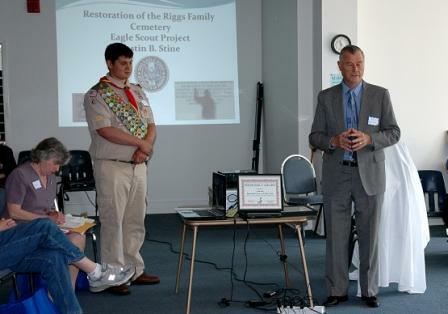 Each recipient discussed the work they have done in their respective cemeteries. Each presentation was informative and well received by the attendees. Visit our Periwinkle page for more information about the recipients and their projects. After lunch Susan Lenz, a creative fiber artist, discussed her art quilts that combine grave rubbings with vintage household items through meticulous hand and free-motion embroidery. While Susan was attending an artist conference she took some material and did a rubbing of a tombstone using the fabric remnant and a crayon. She then quilted the rubbing she made. She was hooked. Her interest in cemeteries now includes the epitaphs as well as the carvings. Her collection of epitaphs is stored in a three-ring binder. She admitted to the group that she wanted to stop collecting at 1,100 epitaphs but is now working to fill binder number two. Another side so Susan’s interest in cemeteries involves the silk flowers that are thrown away. She takes the discarded flowers apart and cleans them in her bathtub. The flowers are then used as part of her exhibits/installations. Susan collects Victorian albums and adds her own photographs of the tombstones and then embellishes the cardboard frames. 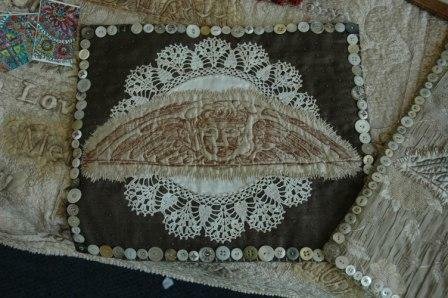 Some of the embellishments include epitaphs from her vast collection. A very unique way to use an old product. Susan and her husband have visited many cemeteries in various states and overseas since that first rubbing. 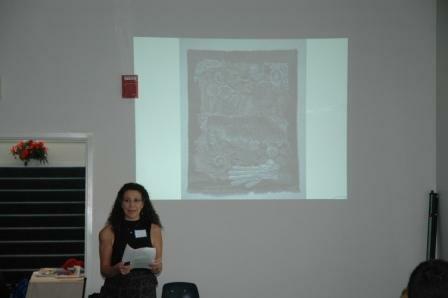 The audience was able to visit these cemeteries through the photographs that were part of her presentation. 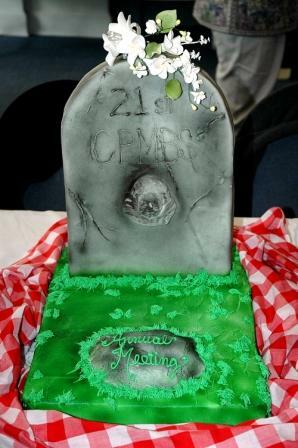 From the response of the audience it appeared many of us were sorry when the program, “The Cemetery in Stitches” ended. At the conclusion of Susan’s program a break was given so that the silent auction could be ended. 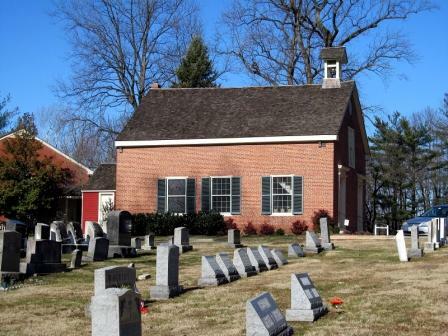 Several attendees were able to take a tour of the Old Brick Church before the day’s activities were concluded. Eileen McGuckian took the lead for the planning and execution of the Annual Meeting. 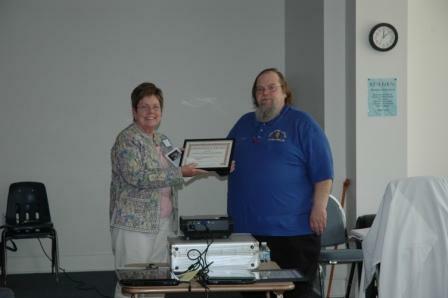 Amanda Becker assisted as well at Gary and Barbara Kraske, Brenda McNeal, and Sandra Wright. Job well done to the committee as it was another successful Annual Meeting.